Golden Banner and Wild Iris fill the meadow in Rocky Mountain National Park's Moraine Park. Stones peak still has a coating of winter snow melting but the wildflowers in Rocky Mountain National Park are really starting to bloom in the lower elevations. 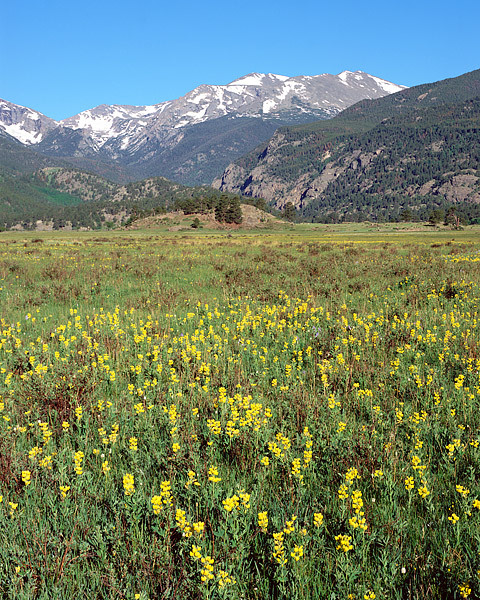 Colorado is well known for its large variety of wildflowers. Blooms vary greatly based on elevation and it will be another month or so until all the snow melts off Stones peak and wildflowers bloom on the alpine tundra above tree line. Photo © copyright by Thomas Mangan.